Truthfully, this will be more of an “overview” of The Dreams of Ruin by Geoff Grabowski than a review. Being friends with Geoof and having written for him, plus being a huge fan of the out there weird fiction science fantasy that populates the spaces in Geoff’s head between gardening and economics (no, really) I am not really qualified to give you an unbiased review of the book. That said, my goal isn’t to simply sell you the book either, except by telling you what it is, for real, and if that’s a thing you want to experience (and it should be) then go out there and get it. Or, well, click here. The Dreams of Ruin (DoR) is a 261 page supplement for Labyrinth Lord and Mutant future, so called Old School Renaissance games published via the Open Games License by Goblinoid Games. As such, the book is compatible with most other old school rules systems, from Swords and Wizardry to OSRIC and, with a little more work, the likes of Basic Fantasy and Castles and Crusades. It is not a complete game, but is also more than simply a setting book or an adventure. Aimed at high level (15th or higher) play it is designed to give epic heroes a run for their money. The title refers to a setting element that can best be described as an inter-dimensional infestation or infection — a world ending seepage across realities that takes the form of a terrible, primeval dark forest haunted by corrupted beats, faceless puppets and hate filled unseelie Fair Folk. It is at once the villain of the piece as well as the location in which adventures take place, and due to its pan-dimensional existence it can contain elements from worlds of fantasy, science fiction and every permutation of the two together. this is the key component of the DoR from a genre standpoint: it hearkens back to the weird fiction roots of D&D, where elephant headed alien gods entertained Cimmerian barbarians and fantastic city states of the dead sat on the ruins of a billion year old Earth. In an era of fantasy dominated by Lord of the Rings and The Song of Ice and Fire on botht eh page and the screen, it can be easily forgotten that what we call the fantasy genre started out much more diverse and stranger than it appears today. If you are familiar with Geoff Grabowski’s work as line devloper of White Wolf Publishing’s Exalted RPG the fusion of epic struggle and science-fantastical elements that dominated that game are here as well, though in a much more focused manner. The art of DoR is evocative of that same weird fantasy vibe. It ranges in both polish and quality but never wavers in tone. Whether it is a horned devil encased in power armor or a Puppet of Ruin (seen in the image above) massacre, the art remind the reader that this fantasy is different than the endless stream of heroic quests that have come before it. In tone, the writing of DoR is generally conversational. The author addresses readers’ (presumably Game Masters) concerns directly, anticipating questions and alternating between readable prose and bullet points. He wants you to be able to understand this stuff so that you can use it in your game, which is often forgotten by game designers and authors. This book is full of strange ideas and non-standard fantastic elements and the author endeavors to get you to understand and accept those elements before moving on to the next bit. That said, it is not “simplistic” and the book does not appear to be written for the Game Master new to the craft or new to Old School games. it is safe to say that the author expects that your campaign reached the suggested high levels through actual play and therefore the GM knows how to run the game and incorporate new ideas. The Dreams of Ruin is more than a descriptive book. The author develops a numbner of subsystems that provide concrete guidelines on how to implement the DoR into a campaign. The two most important are the rules governing how the “dark forest” manifestation of the Dreams works in play, and the rules for actually overcoming the threat of the dreams. As stated above, the DoR are an infection in the world. Not surprisingly, that means it starts out small and grows in both size and virulence. In the parlance of DoR, the Dreams go through a series of Blossomings before they consume the whole world. The author lays out in meticulous detail how each blossing occurs, including tables for the size of the Dreams as they spread. In addition, each stage of the Dreams is given its own encounter tables and associated rules. It is possible using these rules to divorce the Dreams from its world ending aspects and simply use it as a very dangerous zone in the campaign world. In addition to encounter tables, there are rules for the effects the Dreams have on those that travel through the forest (hint: it isn’t good) and the various sorts of entities and hazards that fill the Dreams. These are more than quick stat blocks. there is an ecosystem of terror here, with warring factions and dangerous interlopers — because of the inter-dimensional nature of the DoR, almost any sort of terror or treasure can be found within. Make no mistake, this is a truly high level threat zone and low level characters attempting to pass through, even briefly, will very likely meet a grotesquely cruel end. 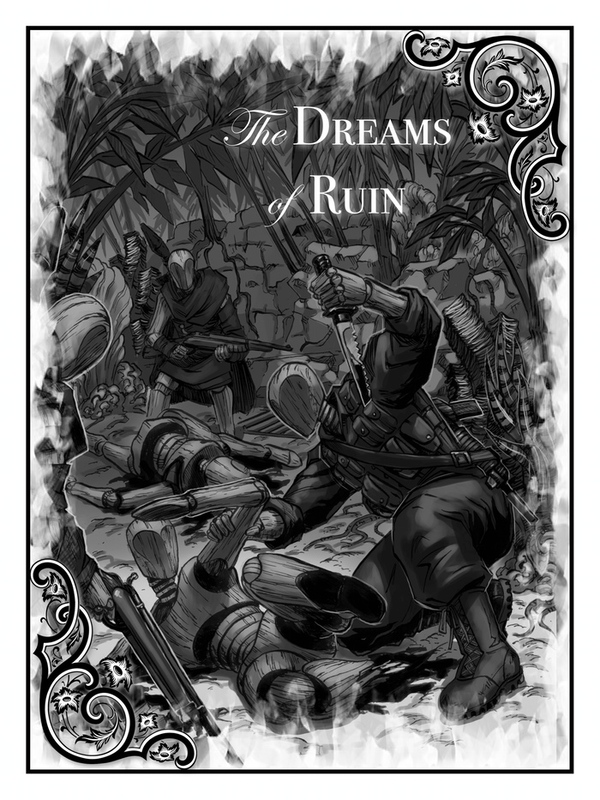 The Dreams of Ruin is unlike anything currently on the market for Old School Renaissance games. It considerably expands the horizon of that particular subgenre of adventure game fantasy, inviting the audience into a world where slaying the dragon and saving the princess are barely more interesting than doing the dishes. It embraces the weird fiction influence of the past while being wholly original. And while I will not give it a grade due to my personal relationship with its creator, I would unhesitatingly recommend it to anyone who enjoys OSR gaming and wants to try something out of this world. 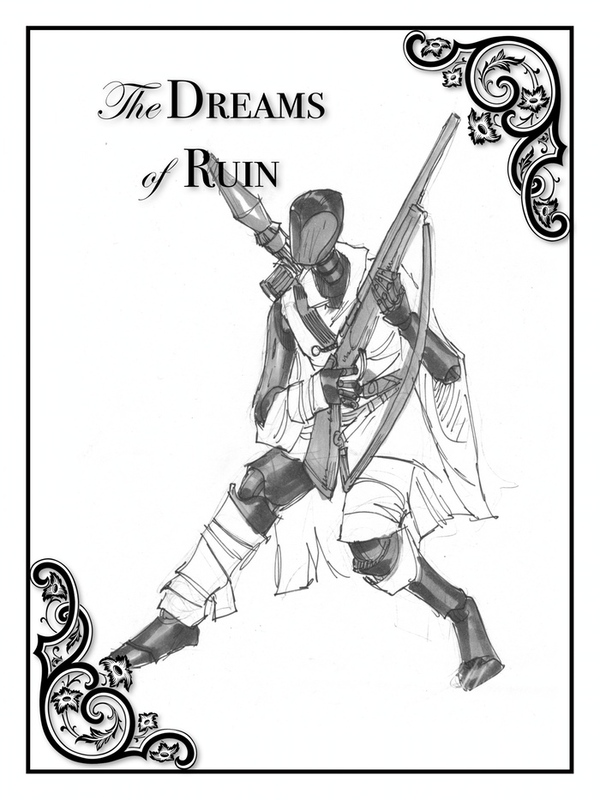 For a few more days as of this writing you can back the Dreams of Ruin Kickstarter here. You can even get a copy of the game here beforehand and then decide that Geoff deserves your support. If you want more information, read my interview with Geoff here. As the official release date (May 15th) of The Dreams of Ruin approaches, friend and colleague Geoff Grabowski agreed to sit down and answer a few questions. He is an interesting guy and this is some interesting stuff. Q: For folks that might not be familiar with you, please give us a bit of background on your work in the field of role-playing games? A: I did a bunch of work with White Wolf back in the late 90s and early 00s. Most notably, I developed the entire first edition of Exalted, was first developer for the Exalted 2nd edition core book, and wrote a bunch of other material for Wraith and Kindred of the East. I also worked on projects for the Scarred Lands setting, for Everway and Kult, and for a few other things I forget at this point. Q: Give us the “elevator pitch” for Dreams of Ruin. A: No-spoiler version: It’s a high-level event book or adventure setting that details a VERY dangerous threat that can seriously challenge OSR parties up to the high teens. It’s not a Sauron ripoff, nor is it a big stack of hitpoints shaped like a dragon and immune to all status effects. Q: With so many role-playing games out there, many of which are supported by open or third part licenses of one form or another, what made you decide to craft Dreams of Ruin for so-called Old School Renaissance (OSR) games instead of, say, d20/Pathfinder or something like FATE? A: I love the openness of the Goblinoid Games license for Labyrinth Lord. No censorship, no fees, and I can include the rules with the distributable. I think OSR is like the “common tongue” of gaming and even if a lot of people don’t love it, most people can understand it very easily. I don’t like 3.x series rules very much. Finally I like the system, and the implicit setting. I ran a multi-year high level old school game and I wanted to build on my experience with that and my love for the Moldvay rules. Q: Dreams of Ruin is neither a complete adventure campaign (“AP” in the modern parlance) nor a setting unto itself. Why did you decide to design it in this way, and what advantages do you think the format you chose has over other formats, such as the AP format? A: In a lot of ways it /is/ a setting. It’s a mobile setting, an *all-too-mobile* setting, that will come to your regular setting and hybridize it. I let the function of the material dictate its form. From a development perspective, one of the things that my situation as an independent author permits me is the ability to create works without worrying about contextualizing them in a product line or worrying about their effects on the storyline of some specific setting. I built the supplement I felt the project needed without particular regard for following anybody’s prior approaches. Game adventures are often seen as unfortunate necessities of development, they tend to sell poorly (1 per group rather than 1 per player, at best) and by making it more engaging — about a topic rather than detailing a specifically constructed series of adventures — I hope that it can find a more general audience than it would if it was a more conventional setting or adventure. I made it as specific an adventure as I thought you reasonably could, given that it’s written for characters of the 14th to 16th levels, who come from any arbitrary setting. No material you write is going to be suitable for *any* group of that size. You just can’t know what near-artifact items they’re going to have, who’s got which evil god chasing them, and what all the dynamics of the setting are. Some characters will rule kingdoms, some will live in townhouses is high-rent magical locales, some will be doing who knows what. In terms of making it more narrowly constructed, like starting with some adventures in the youths of the characters that introduce key concepts and then developing them more as time goes by — I find that stuff utterly dismal to write. When you are outlining a property, you often put in big adventures to “show people how to use the setting” and as a place to trial young writers. Also, I feel like it’s making the decision of what kind of characters you are and what kind of setting you’re in for you, in order to make the design challenge easier. I’m this one guy writing this one book that’s not attached to a particular setting or promoted property. I can’t expect anybody to take dictation from me about what kind of game they need to run to use my material. At the same time, I can write without talking down to the notional “average reader,” trying to accommodate someone who is a newbie gamer, or worrying about if it’ll whip sales for tie-in supplements. Q: The art is unique and evocative. Tell us about the artists and the art direction. A: I have the fortune to have some good artists as my friends, and they took the time to understood exactly what I wanted and needed. They worked directly with me. I had a limited budget but I knew exactly what I wanted / needed, and I feel I got a good result from our efforts. Part of the advantage was that most of the special encounters and the basic beasties were written very early in the project, so I had the artists working almost the entire time I was writing on the book. It gave me and the artists a lot of slack time. Q: What aspect of Dreams of Ruin are you happiest with, or are most excited for customers to see? A: The sculpture aspect of it where many terms of its license and packaging closely resemble the material it describes. For various reasons — commercial sanity, lack of concept and product line continuity foremost — you generally don’t get to be that artful with product design. This project’s license structure and all-in packaging concepts went hand-in-hand with the product content from the very beginning of the project. Again, the benefits of being an independent author working on a freestanding project. Q: Is there going to be a “Dreams of Ruin tour”? Are you planning on hitting the summer convention circuit in order to support the product, or maybe even run a few sessions? A: Doubtful? I’m preparing to sit for my CPA right now. I’m hoping to take it in the Autumn or Winter test windows. Hopefully the product will support *me* this summer so I can take time off to study. I might make it to Origins to hang out with people, or *possibly* GenCon if it makes a tremendous splash and someone wants the prestige of having me in their booth as a conversation piece. Q: You funding model is different than we usually see owing RPG products on Kickstarter. Can you explain how it works and why you chose to do it this way? A: Well, I had the luxury of having the cash in hand sufficient to fund the project in advance. We don’t have some minimum capitalization written into the business plan to fulfill before we’re viable — so one big difference is that our KS funded at 1 unit. It actually funded before it was announced as open. It’s all just a question of return on investment. That was fun, no antsy GIVE, GIVE TIL IT HURTS pleadings with the family and friends networks in store. The other part is that we’re not really trying to make a business out of selling reproductions of the work. I mean, we do that, but we also give the archive away. When we accrue enough income from the sale of the product, we’re going to set the rights to CC-BY, and then people will be able to reproduce it commercially or make commercial derivative products based on it. What I am doing is selling the entire product to its nascent fanbase. Not just off-prints of the material, but the material itself. As the KS does better and better, we’re going to include the art and edited raw manuscript and the layout files and so forth in the archive, so people can more easily make new stuff out of it. The license also has a time component, so no matter how well it does financially eventually people just get the stuff to play with. This is a modification of the Street Performer Protocol that Einsturzende Neubauten used to fund their albums _Supporter Album No. 1_ and _Airplane Miniatures_. However, rather than a pledge/escrow system where the patrons hold out payment for completion of the product (Patreon is SPP implemented serially) we use a pledge system that starts with a complete product that is free (gratis) and turns it into one that is free (libre). The purchase of the archives is purely symbolic, a co-optation of consumer capitalist value transfer networks to allow patronage of free culture. The artist is never kept under compulsion for promise of reward, the consumer is never subject to false scarcity or artificial status anxiety from lack of constructed wants, and the proceeds of the work are shared by all. I believe this is an efficient value transfer model and did the project in part to promote the model. Thanks again to Geoff for the interview. Next up, The Dreams of Ruin reviewed!